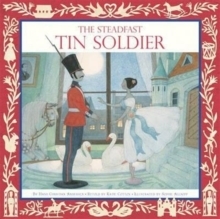 In this classic Hans Christian Andersen tale of devotion and bravery, a one-legged tin soldier falls in love with a beautiful ballerina, but a jealous jack-in-the-box pushes him out of the nursery window. The tin soldier travels in a paper boat, gets eaten by a fish and, returning to the nursery, is thrown into the fire by a little boy. As the ballerina follows him into the flames, the two can now play together forever.